How Important is Writing an Objective in Your Resume? 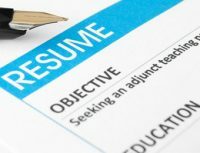 Writing objectives for resume is important in critical recruitment decisions. Take for an instance that there are two employees applying to be operations manager of the same company. Both have strong credentials and impressive working experience that the employer cannot decide which one they should hire. So for good deliberation, they reviewed the two resumes. Who among the two prospects do you think will they hire? Even if the said situation seldom occurs in companies and employers, just consider how human resource personnel ever endured to reading cover letters with the same intent over and over again. Boring eh? Well, even HR’s are humans. Most of them might pay just little attention to the cover letters and proceed to focus on your resume. Yes you may assume that your letters will be read but that does not guarantee that it will be given full attention by the employers. And what will happen if in case it was lost on the desks of the HR? Of course, they will refer to your objectives to see which particularly is your intent, to know what you want from them so as to make sure that they evaluating you based on the qualifications of the right post. This also comes of big help especially when an applicant only has few experiences for the job. The section is where you can justify your application. It is where you can explain what you can contribute despite being an entry-level candidate. Contending for artistic careers, where the extent of the creative abilities of the applicant does not reflect much on his experiences. Elaborating how one’s expertise will help the organization can do wonders. Trying to enter a new career path. Indicating what your previous experiences can introduce to the business can be a plus point. It is highly advised to elucidate how the assortment of your skills will positively affect the way you work. Targeting a particular post. If you’re a writer, here’s where you should indicate what specific tasks are you expert at, so that the hiring manager won’t guess whether to group you in an artistic section or in a technical one. Writing objectives for a resume does not only give an applicant the chance to endorse himself. It also keeps them away from the pitfall of sending aimless information that will confuse the employer where to put you in the company.